Gauge 22sts & 28rows to 10cm / 4″ square using 4mm (6U.S. / 8 Imperial) needles. A good all-rounder, this very close fitting sweater with waist shaping is ideal for many occasions. Knitted in a self-patterning yarn, as shown here, it is great for relaxing at the weekend, whether at home or on cool weather walks; knitted in a solid colour yarn it could be paired with smart trousers or a skirt and worn to the office. This pattern gives instructions for all ladies sizes from UK size 6 (US Size 4) to UK Size 26 (US Size 24). (Chest sizes 76 to 122cm). The pattern gives estimated yarn requirements for each size. The main body of the garment is worked in stocking stitch with 4mm (size 6 US) needles, with the edgings worked in a single rib stitch using the 3.5mm (size 4 US) needles. If using metric needles, you might find that 3.5mm is not available and 3.25mm can be used instead. 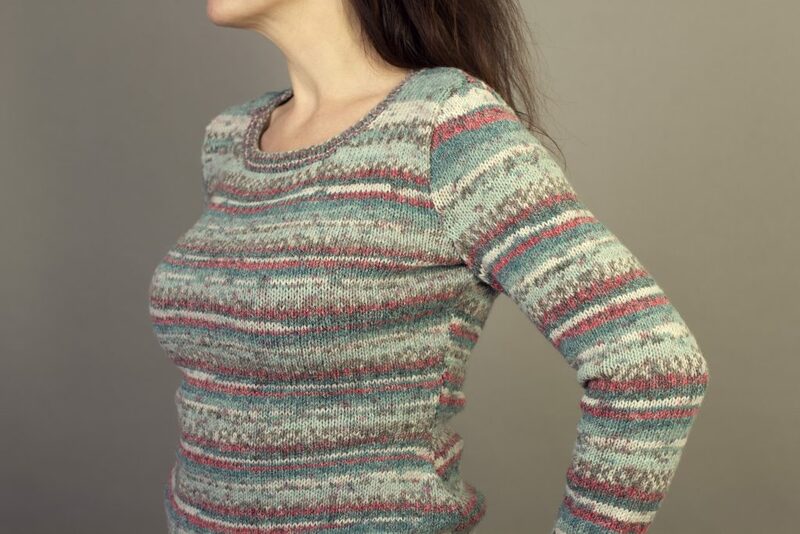 The pattern shows the garment knitted using Sirdar Crofter, a self-patterning yarn. Any DK / Light Worsted yarn that knits to the specified gauge may be used.